Want to Feel Happier and Be Healthier? Have CHOCOLATE! Hey, it’s almost Valentine’s day and so since we all love chocolate and know that it can be “healthy” let’s find out how to use the right kind of chocolate to help make us healthier – and yes, happier. With out the guilt and without the dreaded weight gain too. 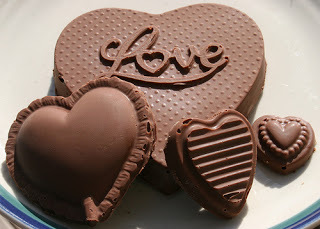 Did you know that for Valentine’s day Americans will purchase around 58 million pounds of chocolate? Hmm… guess that’s why we love it so much, right? Unfortunately, the junk most people buy from commercial sources for Valentine’s day deliver precious few of the true health benefits from chocolate the way nature intended. Make your own super easy – super quick – traditional candy right in your own kitchen. Below I share with you a way for you to easily make your own super easy and delicious make-overs of your favorite candy shop delights. I want you to enjoy Valentine’s day with chocolate if you wish…but perhaps get your chocolate fix in a healthier way. The special page above is for my readers from my brilliant friend, Kelly Herring. Grab her brand new Carefree Candy Guide + 2 free bonuses – Better Breakfasts and Soda-Fountain Favorites. Kelly is truly a talented chef who has spent the last 10 years in the kitchen to make over our favorite recipes with intelligent ingredients to replace the old, unhealthy ones that make us fat and sick. Now, use her easy, delicious candy recipes and actually let candy make you healthier and leaner. This Valentine’s day why not give your sweetie the gift of great taste — and great health — by making a small assortment of good-for-you chocolates and candies. Think it’s too time consuming or hard to do? Well, think again! Dozens of the healthy candy options listed in Kelly’s brand new CareFree Candies require just a few ingredients… and take just minutes to prepare! Candy doesn’t have to be a guilty pleasure. It doesn’t even have to be a once-in-a-while treat. In fact, when it’s made with “intelligent ingredients” candy can actually protect – not wreck – your health. It can even help you sculpt a lean physique… instead of puffing up your muffin top! Now, feel free to share this with all of your Facebook friends so they can enjoy yummy healthy candy too.